You know, before this summer, I didn't realize how helpful a bottle warmer really could be. Then, I went camping. Now, a bottle warmer is on my camping must-pack list! Seriously, this is a genius idea. 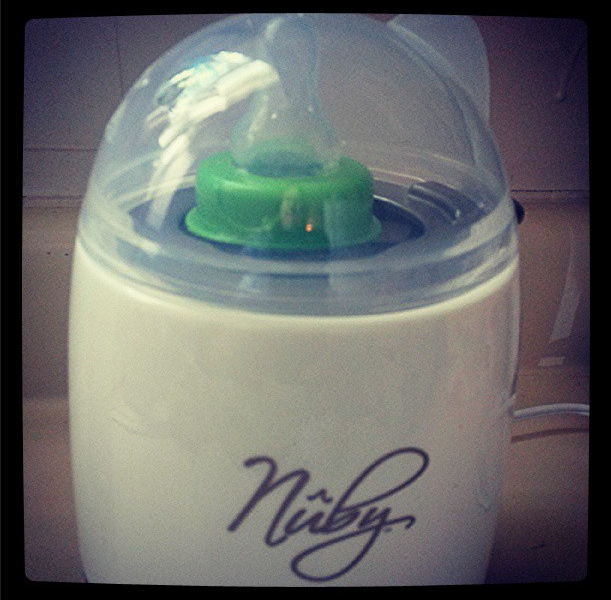 If you are camping and have access to electricity, you will want to bring the Nuby One Touch bottle warmer! It is so much easier to prepare bottles while camping with this. I used to either use hot tap water from the bathroom who knows how far away, or I would heat up the bottle in a pan on the fire. Both options took forever, but thankfully the Nuby One Touch doesn't! It's very helpful around the house as well... baby drop his pacifier (again)? Did the dog try to take a taste?! Just pop it in the One Touch and within minutes it's sanitized! There really isn't anything difficult about the Nuby One Touch bottle warmer, and I don't have any complaints about it. I love that it helps heat up breast milk for my husband- and he doesn't have to guess the temperature. He knows that the One Touch will heat it up to "just right".